The whole faster-than-light-neutrino thing is an absolutely wonderful example of the scientific method at work. How many other fields of endeavour would handle this the same way? Can you imagine a salesman saying, “We’ve come up with this product, but we’re a bit surprised to discover that it seems to do something we didn’t expect really, really well! Could you check this for us? Is it as good as we think, or have we just screwed up somewhere?” Mmm. This is exactly how science is meant to work. I think it’s wonderful, and it makes me proud to be a scientist. In my studies of transatlantic cultural differences, I have pondered the fact that many successful American companies have been started in garages. HP, Apple, Google… It’s almost a tradition now. Three of my recent companies – Ndiyo, DisplayLink and Camvine – began life in the shed at the bottom of the garden of a rented house here in Cambridge. The house was used for meetings, for management, for coffee-preparation, but it was the shed where the important stuff happened. Though, to be fair, it was a very fine shed, with four desks, Velux windows and views of the college playing fields next door; it would be fairer, perhaps, to call it a studio. 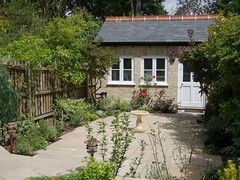 About 18 months ago, Rose and I built a new shed at the bottom of our own garden. (No Velux windows in this one, though it does have three runs of Cat-5 cable going to it from the house.) We built it mostly just because we needed the space, but some friends saw this as heralding something more significant. You now how, in a movie, when a female character is suddenly sick for no apparent reason, you can tell it won’t be long before you discover she’s going to have a baby? That kind of thing. Well, as it happens, I do have a project which I’ve been wanting to work on for some years, but haven’t had the chance. I’m not sure whether the technology is really viable, and I can’t talk about it publicly yet because if I can make it work, I may need to write some patents. But I think it’s worth trying. And so this past week was my last full-time week at Camvine, though I’ll be doing some part-time work for them for a while to help smooth the transition, and maintaining close contact with the company whenever I can. It’s a great team, and they have my strong support and best wishes going forward. First, I’m then going to take a couple of weeks just to potter about a bit. Other than visits to the in-laws, I think I’ve only had one holiday since I started Camvine four and half years ago, so a short break will be welcome. But last week also marked the incorporation of my new company, Telemarq Ltd. Sounds good, eh? You know and I know, dear reader, that it means ‘Quentin trying to make new stuff work, while propping up his rapidly dwindling savings with some consulting’. But please don’t tell too many people! You can tell them, however, that the Telemarq headquarters are in a shed.